in your choice of male and female configuration. A Spherical Rod End is a mechanical articulating joint. Such joints are used on the ends of control rods, steering links, tie rods or anywhere that a precision articulating joint is required. A ball swivel with an opening through which a bolt or other attaching hardware may pass is pressed into a circular casing with a threaded shaft attached. The threaded portion may be either male or female. 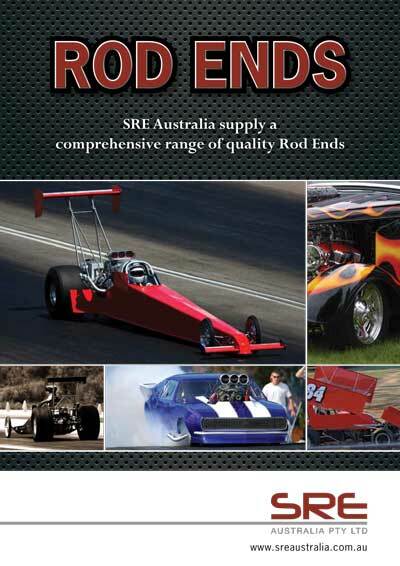 Rod End bearings may be found in cars, trucks, race cars, motorcycles, lawn tractors, industrial machines, go-karts and many more applications. Zinc plated Permanently bonded to race I.D. Manufactured in both male and female from 3/16 unf through to ¾ unf. Also available in step sizes. Heat treated Permanently bonded to race I.D. Manufactured in both male and female from3/16 unf through to ¾ unf. Manufactured in both male and female from 3/16 unf through to ¾ unf. Permanently bonded to race I.D. Manufactured in both male and female from 3/16 unf through to ¾ unf. Step sizes also available. A ball joint consists of a bearing stud and socket enclosed in a casing; all their parts are made of steel. The bearing stud is tapered and threaded, and fits into a tapered hole in the steering knuckle. Protective encasing prevents dirt from getting into the joint assembly. Usually, this is a rubber-like boot that allows movement and expansion of lubricant. Motion control ball joints tend to be retained with an internal spring, which helps to prevent vibration problems in the linkage.